With the immense grace of our Guru Maharaj H.H. 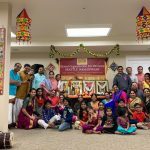 Sri Sri Muralidhara Swamiji, Seattle G.O.D Satsang had a 6 day utsavam on the occasion of the birth of our little Krishna. 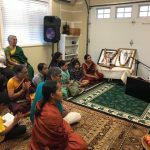 The utsvam was held at various homes in Seattle area and we were also able to take it to Portland, Oregon on one day. 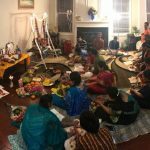 Sri Ramaswamyji from Houston conducted it. As part of the utsavam, we had Srimad Bhagavatha Parayanam everyday. 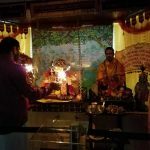 The utsavam was attended by around 100 people and everyone went home enthralled with Krishna Katha and Krishna Smarana. The evening started with Srimad Bhagavatha Parayanam, dasama skandam, Krishna jananam, led by Sri Ramaswamyji. After the parayanam, Sri Ramaswamyji gave Krishna Jananam Pravachan and expounded on how the ever merciful Bhagavan took Krishna avatar to help us give an easy way to remember Him through katha and leela smaranam. We did Nandotsavam at the end of the Pravachan to the songs such as “Avatharithan Kannan” and did gummi around the little baby Krishna. The morning started with continuation of previous day Parayanam of Srimad Bhagavatham, dasama skandam, led by Sri Ramaswamyji. After the parayanam, Sri Ramaswamyji talked about the importance of nama and how chanting the names of the lord can take away all our sins. 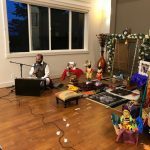 The evening started with a rendition of various Guru Kirtans, Krishna Kirtans, Ashtapadis. Jaanavasam and Oonjal seva were done while rendering various Madhurageethams. 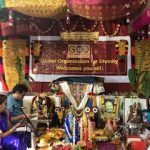 Many devotees brought seeru that was offered to the lord after which Kalyanam was done to Kalyana Ashtapadi and Lagnashtakam. A lot of handmade flower garlands were offered to the lord. Sri Ramaswamyji spoke about Nama Mahima and how nama alone is enough in this Kali Yuga. The morning started with Srimad Bhagavatha Parayanam led by Sri Ramaswamyji. As the household had Andal in their house, Sri Ramaswaymiji talked about the importance of bhakti, the bhakti performed by Azhwargal and especially the bhakti performed by Andal. 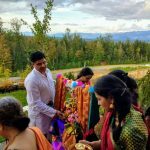 He concluded the pravachan by doing Andal Kalyanam to the rendition of 4th Paasuram and Kalyana Ashtapadi. 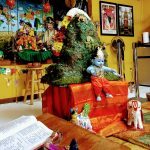 That evening, Sri Ramaswamyji went to Portland, Oregon where he gave a paravachan on what is Srimad Bhagavatam, the importance of it and concluded it with conveying what the essence of Srimad Bhagavatam is, which is nama. 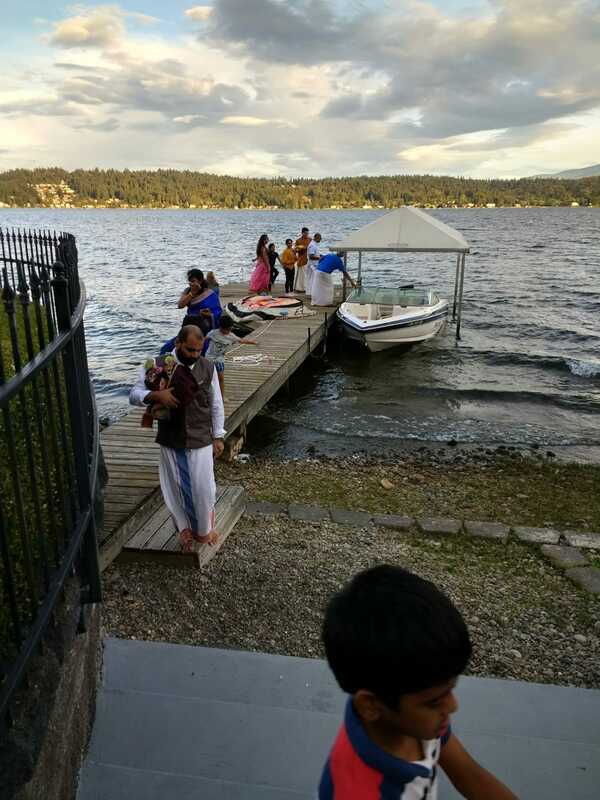 The Satsang was attended by around 10 families. Sri Ramaswamyji did pravachans on Guru Mahima. He beautifully talked about how various texts talk about the importance of Gurus and gave various instances from the lives of various Guru’s including Yogi Ram Surath Kumar, Ramana Maharshi, Ramakrishna Paramahamsa and our very own beloved Guru Maharaj, H.H. Sri Sri Muralidhara Swamiji to show how a Guru takes care of His devotees as a brother, as a father and even as Bhagavan Himself. 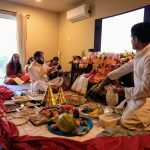 Since it was a new home entering ceremony, the day started out with Guru Paaduka Pravesham as some chanted Hare Rama some, some sang Varuvai Varuvai Gurunatha. From this point on, for next 8 hours nama was chanted while still continuing with Guru Paada Pooja, Guru and Krishna archana and divyanaamam. Sri Guruji Paduka was taken around the house to sanctify the home. At the end of 8 hours of nama, Sri Ramaswamyji rendered Srimad Bhagavatham, dasama skandam, Govinda Pattabhishekam and explained it along the way. 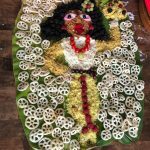 A Krishna lifting Govardhana was made out of rice and later to riveted chants of “Govinda Govinda” by everyone, and to the offering of many flowers to the Lord, Govinda Pattabhishekam was done. 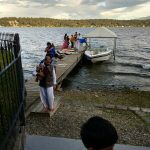 A small Thepotsavam followed the Pattabhishekam in Lake Sammamish. The evening concluded with Sri Ramaswamyji’s speech on Guru Mahima.